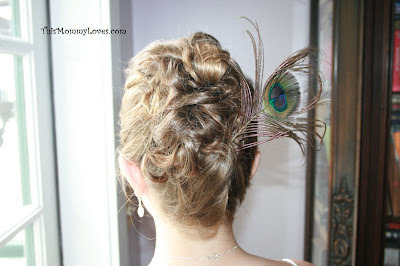 This Mommy Loves: When Life Hands You Peacock Feathers, Make Hair Accessories??? When Life Hands You Peacock Feathers, Make Hair Accessories??? Well, first I should mention that I have a slight obsession with peacock feathers recently. So imagine my surprise and delight when we were getting ready in the bridal suite on wedding day and the bride spots this vase in the corner of the room. With a quick snip of the scissors, some hot glue, and a bobby pin, these fabulous hair assessories were created. 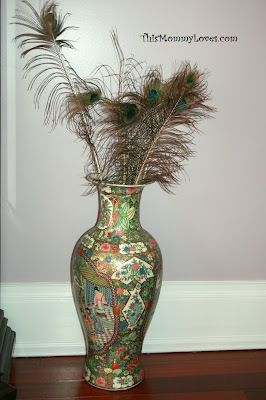 Wonder how long it will take the owner of the house to realize some of the peacock feathers in the vase are cut off at the top....Shhhh!